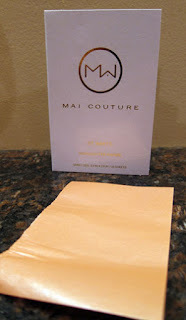 THE SKINNY: Use this highlighter paper to add shimmer and glow to desired face and body. I've never heard of highlighter paper until I received this in my December Ipsy Box. When I first realized that it was makeup in paper form I was quite skeptical. I have very oily skin and I assumed that these would work more as an oil absorber than a highlighter, BUT, I am pleased to say that I was wrong. I applied the highlighter paper to my cheekbones, nose bridge, middle of forehead, and my chin. The highlighter paper added a warm, beautiful glow that brightened my face instantly. If you're looking for something to help freshen up your look during the day, this is your product! I will probably use this product a lot more during the summer months when I have a little more color. You can even use the paper to highlight areas of your body, like your collarbone or top of shoulders. I don't see myself using these with my daily makeup routine, but they will be great for special events and girls night out! KEEP OR TOSS: Keep. The sheets are so easy to use, mess free, and fun! I look forward to using these a lot more during the summer. CHECK IT OUT: You can order these at maicouture.com. The highlighter paper only comes in one color, St. Barts.